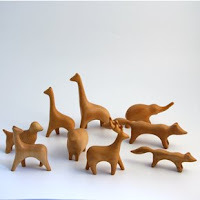 These gorgeous animals are carved of various woods, unpainted, and finished with beeswax. I love the sheep, the fox, and the reindeer. From Romp.